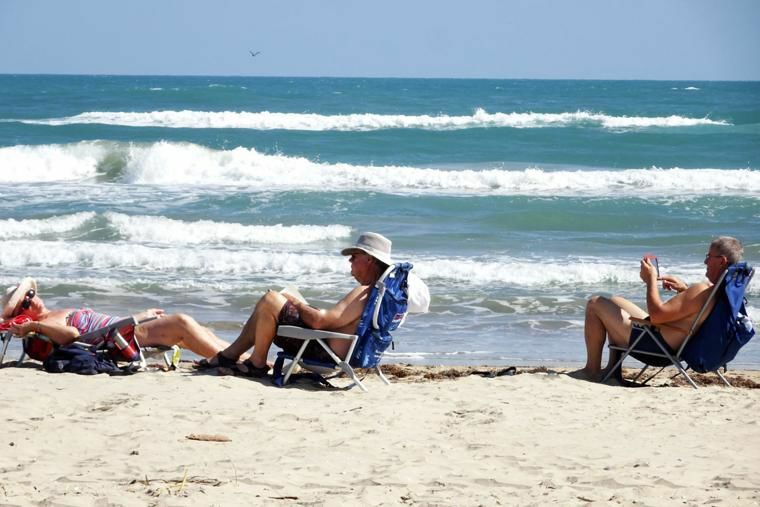 Sunbathers bask in the sun at Isla Blanca Park on South Padre Island. The highly anticipated opening day of Isla Blanca Park winter reservations is almost here. Visitors will be able to reserve RV spots in-person or by telephone in two phases beginning Sunday. Guests who plan to arrive October through December can make their reservation starting Sunday. Visitors who will check in during January through March can begin making reservations June 16. The parks office will remain open until 7 p.m. on both days. Vega said 19 RV slips will be closed during construction in the Dolphin Cove area and beach pavilions. There is still ample parking for public beach access, he added. The park’s boat ramp reopened in May after being closed due to the nearby construction. The Dolphin Cove amphitheater and multipurpose building will be competed by August, weather permitting, he said. Renovations to the pavilions are expected to wrap in November. Cameron County revised its Isla Blanca Park reservation policy last year in hopes of making the process more equitable. Under the previous system, it was possible for people to keep the same RV spot each season for decades by making a reservation for the next year upon check-in. Commissioners approved limiting reservations up to three months during summer and to no more than six months during the off-season. Hundreds of people camped out overnight near Isla Blanca Park for their chance to claim their RV slip when summer reservations opened Jan. 15. People began camping out as early as 5 p.m. the day before. Vega said an online reservation system is in the works and should be completed in August. For more information, visit www.cameroncountyparks.com.